This spacious, executive-style house is located two blocks from the base of Mount Alyeska Resort in the beautiful Girdwood Valley, a 35-minute drive along the ocean shores of Turnagain Arm south of Anchorage. As one of the finest luxury rental homes in Girdwood, this all-redwood-sided house features a large, gourmet kitchen with Brazilian granite counters, a professional gas cook stove, an Indian slate floor, elegant stainless appliances, and a roomy kitchen island for seating and entertaining. Offering over 3,000 square feet of luxurious space, decorations include a variety of local art from Alaska's best known artists and multiple alaskan motif stain glass windows. 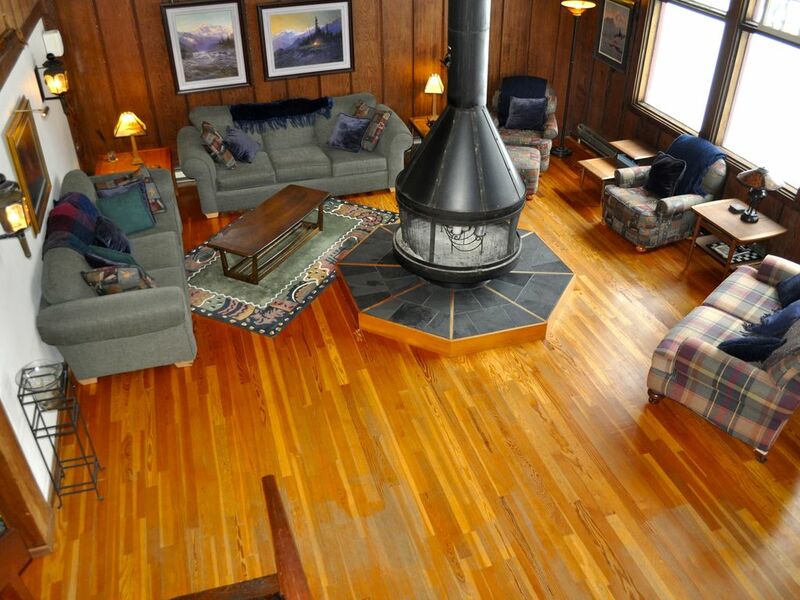 The main living area has hardwood floors, and features a large open circular fireplace with multiple couchs and chairs around it and a wall of windows with a gorgeous view of Mount Alyeska. There is also a game room area with a pool table, stereo, and a carpeted TV room with a large flat screen TV with cable, DVD/VCR surround sound system and several more comfy couches and chairs for relaxing at the end of a hard day. The main bathroom features a large, multi-person 80-gallon Jacuzzi tub set in travertine tile, perfect for melting your aches and pains away. Wireless internet is available for those travelers needing to stay in touch with the world. There are four carpeted, roomy bedrooms upstairs and a bath to service three of the bedrooms in addition to the Master Bedroom bath (and a third full bathroom on the main level). 1. Master Suite: One king-sized bed, TV/DVD and a private bath with jetted jacuzzi tub. 2. Bedroom Two: Two queen beds and one twin bed, TV/VCR. 3. Bedroom Three: One queen bed, one twin bed and a full-sized baby crib. 4. Bedroom Four: Two double twin-sized bunk beds (total of four beds). If you are looking for a comfortable house to base your South-central Alaska travels from in one of the finest communities in Alaska, Girdwood Valley is it. On the shores of Turnagain Arm, surrounding by seven glaciers, tall mountains, North America's northern most rain forest and located 35 minutes from Anchorage along one of America's most scenic coastal highways, Girdwood is to Alaska what Aspen is to Colorado. My wife and I were born in Anchorage and have lived and skied in the mountains around Girdwood and on Mt. Alyeska since our youth. After spending many years outside Alaska getting educated, we returned to our home state, fell in love and have been raising our family here ever since. I am a general aviation pilot and enjoy flying around Alaska and seeing the state. I run a real estate business and have rental properties in Girdwood and Anchorage. Mount Alyeska and the town of Girdwood is Anchorage's local ski resort, nestled in the heart of the Chugach Mountains just a short drive from Anchorage. Girdwood is a charming town that is filled with huge spruce trees, surrounded by mountains and glaciers and best of all, it snows a ton in the winter making the skiing some of the best around. Our home is just a few hundred yards from the base of Mt. Alyeska. Located on a well kept bike path that leads to the mountain, walking or biking from our home and accessing the rest of the Girdwood Valley is easy. Our luxurious home is very open and spacious, has a wall of windows facing the mountain, and a large open circular fireplace that will make you feel like you are in your own ski lodge. 80 Gallon jacuzzi tub in large bathroom main floor. Master also has jacuzzi tub. Views of Mt. Alyeska from floor to ceiling wall of windows in great room. Linens are provided for the number of guests indicated on each reservation. Additional persons can always be added prior to arrival. Towels provided for the number of guests indicated on each reservation. Additional persons can always be added prior to arrival. Open kitchen, granite counters, everything you need for gourmet meals to Webber grilling outside under covered carport. We have two antique drop leaf tables that we set up in the expansive diving area located between the kitchen and circular fireplace living room. Full size professional pool table with new felt and several cues to choose from. Legos and toy box for most ages. 2 blocks to base of mountain and chairlifts. Bike path the entire way. Our family has stayed in Girdwood many times. Usually we stay in the hotel or in a condo. This time I decided on staying in this house. It worked out great. The space is excellent for a family and friends. It is close enough to the ski area and to restaurants and grocery store that the kids can walk. They also walked to the shuttle a couple of times. For once we weren’t all tripping over each other in tight quarters. The large kitchen is great, as is having a clothes dryer since it was a rainy week at the ski area. My wife would have liked to have an outdoor hot tub. We do plan to stay here again. A beautiful home! Very thoughtful owners!! We thoroughly enjoyed our time here! It was spacious and ready for our large gathering. Kitchen was well stocked. Fire pit was perfect. Open living area allowed us to have a yoga class with all 10 of us. We really enjoyed staying in this beautiful home. Audrey was awesome to work with. We loved everything about this house. My teenage kids did not have a problem staying entertained playing pool indoors when it rained one afternoon. The location was ideal for us to travel to Whittier and explore the Kenai Peninsula including Seward. We would definitely stay here again. It was the perfect home for our family to celebrate Christmas .. we had everything we could possibly need to share wonderful memories! Thank you Win and Audrey for sharing your special home with us. We enjoyed every moment! The great room concept with the fireplace was what we first fell in love with. So much room to move around and feel like we all had our own space. It was nice at the end of a long day to kick back on the recliner couches. Owners were very responsive while we were there (we didn't need much, but a couple of texts to help us navigate!). Everything was very clean as well. We would recommend it to anyone and definitely stay again if given the chance. Thank you! Thank you. Come again sometime. We love happy guests. Just a 2 blocks from Alaska's premier Ski Resort Mountain, Alyeska Resort.